Concern General Motors vitalize its show exposure on January motor show NAIAS 2006 in Detroit with attractive concept car with the name resonating in ears of all car fans. CHEVY CAMARO - the legendary sport coupe, in its time respected from the powerful European GT fans, revive in Detroit like modern concept to test its selling chances of its potential serial production. Camaro concept incarnates feeling of power that the old model was famous for. Now it is one of the most popular collector cars. Concept was designed for actual generation of young sports fans and to evoke the emotions in faithful advocates of original version. Optically very low bodywork silhouette and wide wheel gauge talks plain language – main mission of this car is power. Long front bonnet with longitudinal arch reveals large front placed engine. 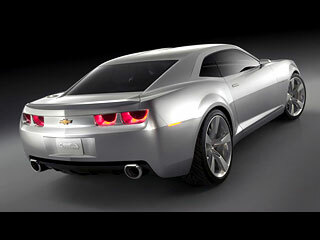 Designers said that the massive lines of rear fenders are modeled so that everyone knows the rear wheels drive the car. Dynamic proportions are raised with unique five-ray wheel disks with diameter 21” or 22”. Designers’ delicates is sinister front look which well-turns bulldog car character. 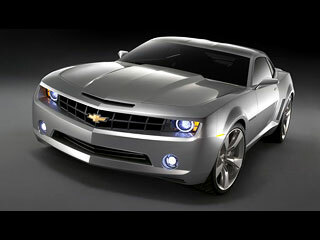 Whole look visually demonstrated with power potential makes from Camaro concept new American “muscle car”. Camaro concept is not only designers study; it can really vindicate its dynamic look. Large front bonnet is hiding the newest processing of legendary V-8 “small-block”. Six-litter LS2 has engine block and cylinder head made from aluminum and it has four cylinders turn-off system during low engine load. Technology marked as Active Fuel ManagementTM shows effective operation of large-capacity engine in specific city conditions. Concept version V-8 LS2 produce output at level 400 horse power and the rear wheels are driven through six-speed manual transmission. Single-wheel suspension of all four wheels with gas shocks and progressive springs make optimal contact with road and good control of vehicle in all driving conditions. Effective braking made disc vented brakes on both axles with diameter 355 mm. Chevrolet Camaro concept is beautiful rebirth of legendary sports vehicle and in case of serial production it will be the respectable successor. We should hope that the customers’ reactions on Detroit motor-show were enough for GM managers to begin serial production of fascinate CAMARO.